Harold Bloom sees modern poetry as a battlefield where new poets fight against their predecessors. Strong poets, he says, suppress the "anxiety of influence" to create something of their own. 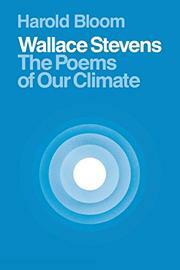 In this book, Bloom applies his theory to the poetry of Wallace Stevens. He shows how Stevens grew out of the Romantic tradition, with its forceful imagery of the Sublime and rhetoric of subjectivity, and fought successfully against his American forebears, especially Whitman. Bloom elucidates Stevens' development through the theory of "poetic crossings," which are the three decisive shifts in every strong poet's career from "one kind of figurative thinking to another." Crossings are both psychological and rhetorical. The first involves the poet's search for assurance of his own powers and expresses itself as a turn from irony to synecdoche; the second shows him trying to reach out to others, and he moves from metonymy to hyperbole; third, he confronts his own mortality and identifies with things outside himself, and his images pass from metaphor to metalepsis. With this last crossing, which occurred with Stevens' "Notes Toward a Supreme Fiction" (1942), "the Stevens who matters most" appeared; and from then onward he exhibited poetic mastery of tradition, rhetoric, and his own anxieties. Bloom's ideas and rhetoric are difficult, and only the determined student of literature and critical theory will struggle to the end, where Bloom defends his theories against the current fashion: Deconstruction. Yet the book glows with insights into both literature and personality and is sure to stand as a megalith in Stevens' criticism.